This episode of The Woof Meow Show from March 16th, 2019 is the third show in a three-part series. Kate and Don discuss; the initial training tasks you will want to focus on with your new puppy. That includes; handfeeding for attention, food as a powerful reward and motivator, and how to use life rewards. They will also address the importance of learning how to keep yourself and other people from inadvertently rewarding behavior that you do not like, such as jumping. Based on their experience teaching thousands of people how to train their dogs Kate and Don discuss why training takes time, commitment, and consistency and how to avoid common training mistakes. Part one in this series addressed things you will want to consider before you bring a puppy home; like choosing a veterinarian and a dog trainer and getting signed up for a training class that uses pain-free, force-free, and fear-free methods. Then Kate and Don move on to things you will need to do when you bring that cute ball of fluff home, and the first thing they emphasize is the need for patience. Kate and Don conclude the episode by addressing these critical puppy topics; socialization, alone training, and housetraining. You can hear The Woof Meow Show on Z62 Retro Radio, AM620, and WKIT HD3 at 9 AM on Saturday. If you are not near a radio, listen on your computer at http://bit.ly/AM620-WZON or your smartphone or tablet with the free WZON 620 AM app. A podcast of the show is typically posted immediately after the show. You can download this show and others at http://woofmeowshow.libsyn.com/ , at Don’s blog http://bit.ly/Words-Woofs-Meows and the Apple iTunes store. Spay and Neuter Awareness Month starts on February 1st. Because this is such an important topic, we do a show on it every year. Ten years ago, the decision of whether to spay and neuter and when to do so was much more straightforward. As new information has become available spaying and neutering has gotten a bit more confusing, especially the timing of spaying and neutering. In fact, Don has been known to say that if you ask five pet care professionals about spaying and neutering, you may get seven different opinions. Spaying and neutering have implications for animal welfare as well as physical and behavioral health, and it is a topic that every pet owner needs to discuss with their veterinarian. Today, Don will be talking to Dr. Mark Hanks from the Kindred Spirits Veterinary Clinic to help end some of the confusion of this critical topic. If you have a pet that is not spayed or neutered you will not want to miss this show. Kate and Don discuss the many benefits of training your precious pup. They consider how teaching your dog to have some basic manners can allow your dog to be with you more often and in more places. They address how training will help keep your dog safe and how it can strengthen the bond between you and your canine companion. Next Don and Kate discuss what to look for in a dog trainer and what to avoid. They also help you learn what to look for in a dog training class. Lastly, they review the dog training classes Green Acres Kennel Shop has scheduled for 2019. In this episode of The Woof Meow Show from January 26th, 2019 Don interviews Dr. Katie Carter from River Road Veterinary Hospital about pet dental care and the importance of preventing periodontal disease. Chronic inflammation or an infection in your pet's mouth, gingivitis, is every bit as serious as an infection anywhere else. When left untreated, periodontal disease can spread bacteria to the liver, the kidneys, the heart, and even the nervous system. Dr. Carter describes a typical dental exam and the teeth cleaning process. She explains why a dental for our pets is done under general anesthesia and the many steps a veterinarian takes to make sure that process is as safe as possible for every pet. We also discuss preventative care for dental health and breeds that are more susceptible to periodontal disease. Learn how you can improve your pet's life by taking care of their mouth! You can hear The Woof Meow Show on Z62 Retro Radio, AM620, and WKIT HD3 at 9 AM on Saturday. If you are not near a radio, listen on your computer at http://bit.ly/AM620-WZON or your smartphone or tablet with the free WZON 620 AM app. A podcast of the show is typically posted immediately after the show. You can download this show and others at http://woofmeowshow.libsyn.com/ at Don's blog http://bit.ly/Words-Woofs-Meows and the Apple iTunes store. You can hear The Woof Meow Show on Z62 Retro Radio, AM620, and WKIT HD3 at 9 AM on Saturday. If you are not near a radio, listen on your computer at http://www.wzonthepulse.com or your smartphone or tablet with the free WZON 620 AM app. A podcast of the show is typically posted immediately after the show. You can download this show and others at http://woofmeowshow.libsyn.com/ and the Apple iTunes store. Kate and Don discuss the change in the seasons and how reduced daylight, lower temperatures, snow and ice, and the hectic holiday season affects our pets. They will offer several suggestions on how you can keep your pet safe and happy. 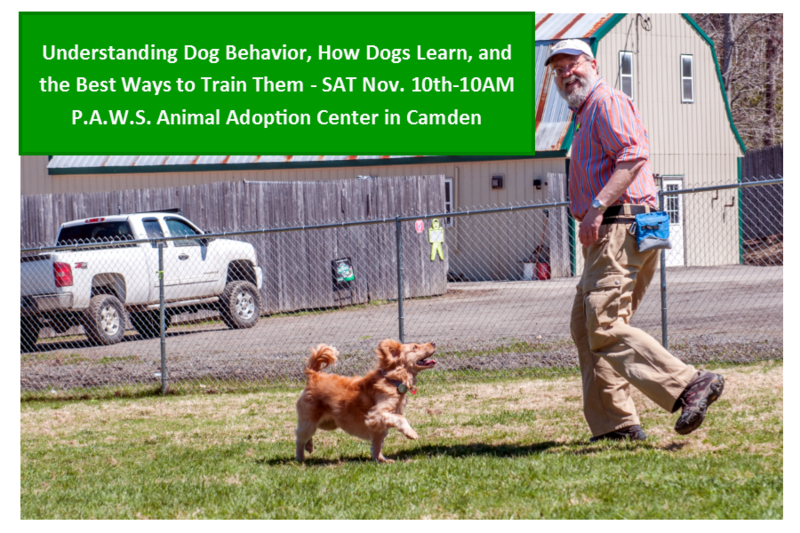 Don’s presentation will address the following questions; What are the myths and facts about canine behavior?, How do dogs learn?, and What is the most humane and effective way to train a dog? In the past few months, the news has been filled with stories about rabid wildlife in Maine. Rabies is a dangerous disease so we thought it would be appropriate to discuss it on the show. Don and Dr. Cloutier from the Veazie Veterinary Clinic discuss Rabies, why it is so dangerous to people, pets, and wildlife, the animals most likely to carry Rabies, how to recognize a potentially rabid animal, how Rabies is treated in both animals and people, and why vaccinating ALL dogs and cats is so important. Don talks with Dr. Katie Carter of the River Road Veterinary Hospital in Orrington about the importance of annual wellness veterinary care for pets. We discuss what Katie looks for in an annual exam of a cat and dog as well as why some pets may need to be seen more than annually. We also talk about how to know when to seek preventative care outside of an annual visit and the benefits of having a regular relationship with your pet's veterinarian. Kate and Don have a conversation with Green Acres Dog Training Instructor Lindsay Ware about her work with her dogs Gander and Aldo and United Blood Trackers. Lindsay discusses how she has trained her dogs to help hunters recover wounded game such as bear, deer, and moose. We also talk about why this conservation work is so important. Lastly, Lindsay shares some stories about Gander and Aldo’s more exciting searches.